Babymouse's big dreams of becoming a race car driver come true when she and her best pal, Wilson, enter the Race of the Century (or at least the school year). But will she and Wilson crash and burn? Or will they cruise to the Winners' Circle? 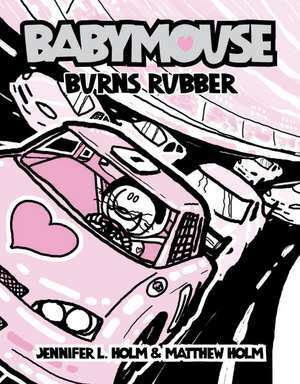 Find out in Burns Rubber—the 12th hilarious, action-packed installment of the beloved Babymouse graphic novel series! Brother-sister team Matthew "Lightning" Holm and Jennifer "Watch out!" Holm are both excellent drivers (though Matt did fail his learner's permit test the first time). Today, Jennifer is the New York Times bestselling author of several highly acclaimed novels, including three Newbery Honor-winners, Our Only May Amelia, Penny from Heaven, and Turtle in Paradise. Matthew Holm is a graphic designer and freelance writer.